George Elliot Clarke Appointed Parliamentary Poet Laureate! We are thrilled to announce that George Elliot Clarke has been appointed Canada’s new parliamentary poet laureate! Congratulations, George! George Elliot Clarke is the seventh person to hold the position and was appointed by Senate Speaker George Furey and the Speaker of the House of Commons, Geoff Regan. The parliamentary poet laureate is responsible for promoting the importance of poetry, literature, culture, and language in Canada. Regan has stated the following about George Elliot Clarke, “his talent as poet, playwright and literary critic is undeniable…he is an immensely versatile and engaging writer and will bring great honour to the position”. 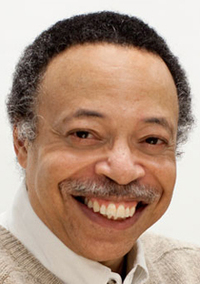 George Elliot Clarke was born in Windsor, Nova Scotia. He has published numerous groundbreaking verse and dramatic poetry collections and anthologies, including Illicit Sonnets. He has won the Governor General Literary Award, the Portia White Prize, the Dr. Martin Luther King Jr. Achievement Award, and he is the E.J. Pratt Professor of Canadian Literature at the University of Toronto. His book Canticles will be released by Guernica Editions in the Fall of 2016. Tagged with Canticles, George Elliot Clarke, Illicit Sonnets, Parliamentary Poet Laureate. Comments Off on George Elliot Clarke Appointed Parliamentary Poet Laureate!